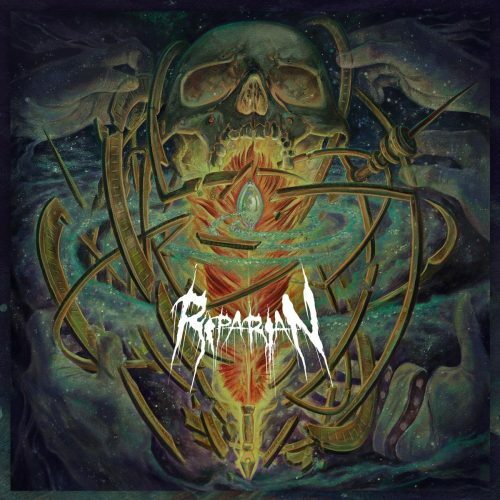 To be clear, the alchemy that Riparian utilize is a sound that might eschew the most technical corners of the Death Metal world, but also isn’t nearly as primitive as most Grindcore acts nor their OSDM counterparts. What we are left with instead is a pulverizing blend of grind beats and mid-tempo muscular riffing. Occasional solos and Doomier passages that also pepper the proceedings give the EP an unpredictable quality as well. 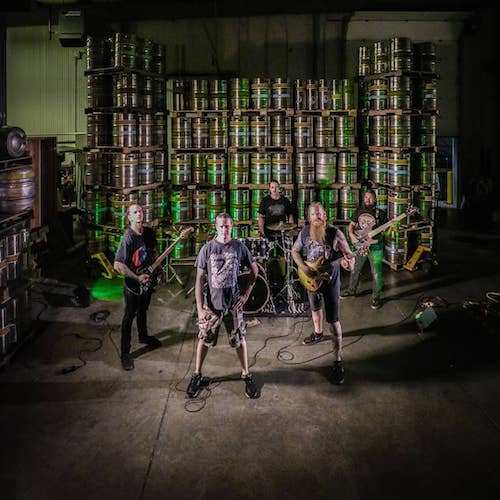 Opener “The Nuclear Unclear” sets the stage well, kicking in with an angular half-blasting riff and following up with a more straight-forward grind section. The quintet bounce nimbly from one move to the next, hitting the listener with feral speed and sludge all within about three and a half minutes. They have more up their sleeve as well, as “Cosmic Undulations” displays. Ominous tom-work gives way to more fevered grinding, but the vocals ride slow on top, adding to the sense of menace. The track closes with some strummed, almost psychedelic guitar ambience. It’s only a brief respite until the onslaught returns. “Event Horizon of Artificial Existence” adds a massive breakdown into the mix, while album closer “Metric Distortion” throws in a bit of modern Thrash for good measure. And while not technical compared to some acts, these guys switch tempos and rythyms at the drop of a dime. And when a guitar solo does claw its way up out of the mix, the results are always well thought-out and memorable. The whole EP is certainly set to kill, and it’s not hard to imagine the havoc these guys could unleash in a live setting. And at under twenty-five minutes, this is the perfect length for this kind of act. Get in and get out, leave a shattered mess in your wake. If Riparian do take a stab at a full-length next, it will be interesting to see what else they bring to the table to keep the listener’s interest. But given the strength of this debut, I will certainly be checking it out.